Report cards are an important means of communication to parents about their children's progress in school. 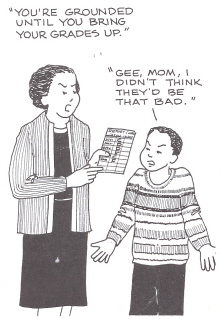 Children often show regular patterns in their report card grades. Early in the school year, there has typically been considerable review, but by mid-year, new and more difficult material has been presented. Mid-year report cards are important indicators of how children respond to challenge. Achieving children either maintain good grades or improve the grades if they're accustomed to coping with challenge. Although their grades may show small ups and downs, their report cards reflect perseverance. Underachievers show several different predictable cycles on their report cards. As you think about your own children's past report cards, you're likely to have seen patterns. There may be some variation depending on whether your child has an especially good or bad relationship with a teacher. Your knowledge of your children's earlier patterns can help you to know how to problem solve with them as you review their mid-year report cards. One group of underachievers (dependent) begin the school year well and earn good grades the first quarter. However, as the work becomes more difficult, they tend to lose confidence, give up, and avoid challenge. Their grades dip as the year continues. By spring, they feel overwhelmed and may be hopelessly behind. If your dependent children's mid-year report cards show declining grades, your plan should involve stra-tegies for more time devoted to homework and study and more accountability to Mom or Dad. If there's a dad in the home, it's a good idea for him to be the main homework supervisor of the boys in the family. Another group of underachievers (dominant) make little effort from the beginning. Their first quarter grades are often poor by reason of their negligence. They either believed they could get good grades with little effort or wanted to see what they could get away with. Their parents often respond negatively with threats and punishments, and children respond by mid-year by temporarily improving their grades. Unfortunately, these children seem to work only when threatened and are not internally motivated. Parents thus tend to increase their punishments. If your children's mid-year report cards have gone up after having been very poor the first quarter, your children are probably dominant underachievers.2 These children may know how to study, and it's better if their successes do not become dependent only on threats of punishment. Furthermore, if you celebrate their progress too much, their grades will undoubtedly fall again. Negotiate with them about how they can maintain their new efforts to prevent the every-other-quarter plunge. Write up a contract with agreed-upon efforts, goals, and consequences, and continue to monitor and encourage their progress. Be absolutely firm, but positive. Parents often assume that rewards for good grades and punishments for poor grades will be effective. Underachievers typically don't have the confidence or the study habits to increase their grades. Despite good intentions initially, they soon despair because they don't believe their efforts will make a difference. Punishments almost always backfire as well. They seem to help temporarily, but students dig their heels in and feel angry at their parents. Parents tend to increase their punishments. In turn, students increase their anger. Rewarding effort, study, and consistency is more effective. Negative consequences can be used for students who do not complete their work as long as privileges are restored when work is completed. Prepare for perseverance as you guide your children forward with love, persistence, and commitment to prioritize schoolwork as first. Of course, many children will bring home good report cards, and they deserve their parents' interest and enthusiasm. Discuss good results and interests with your children as well. Again, rewards are quite unnecessary. Hopefully the learning and good grades will be sufficient reward. However, if they ask for a reward, you can go along with it as a game they deserve to be allowed play at their personal request. Whether report cards carry letter grades A-F, E-U, S-F, number grades, or written comments, they deserve your attention. They are effective methods for teachers to evaluate your children's progress and communicate this progress to you. Parents should do their part by reviewing report cards with their children to plan for progress. They should also communicate to teachers by asking questions and expressing their personal concerns about their children. Whether your children are achieving or under-achieving, problem solve together, and don't blame your children's teachers. Some children do try to get you to side with them against teachers. Do take the initiative to communicate with your children's teachers to get their perspective on problems. Also, emphasize study and effort, rather than grades. If your children put quality time into study and you or their teachers give them study techniques, their grades will automatically improve without their feeling more pressure than they need to feel. 1See Strategies for Dependent Students, Why Bright Kids Get Poor Grades (Rimm, 1995). 2See Strategies for Dominant Students, Why Bright Kids Get Poor Grades (Rimm, 1995).